There have been many reports detailing spikes in auto thefts throughout Austin, Texas. Thefts at auto dealerships are nothing new to any of us; thieves have been heading right to that source for years, and why not? Often, car lots are unmanned with no security and they offer a wealth of parts, electronics, and items car thieves want. The fact that most parts and vehicles are in great condition at car lots makes them all even more enticing and tasty to any car thief. Over the last two decades there have been considerable efforts made by local law enforcement agencies to control the rate of car thefts by creating awareness and increasing patrols. You may see “crime awareness signs” and warnings reminding you to lock your doors posted in many locations, along with threats of possible “bait cars” even being parked in the parking lot, all in an effort to scare away thieves… but, the fact is that these efforts have only had limited effect, as car theft is still considerably high, and is unstoppable. The fact that it is unstoppable by any efforts from law enforcement leaves you with only one card to play, that is, to ensure that although car thefts will continue to happen, they just won’t happen on your car lot. Interestingly, out of all the different forms of car thefts, the rate of vehicles stolen from parking lots is the highest. It seems as if parking lots are the easiest targets for car thieves. Knowing there is a good chance that vehicles can be easily stolen, the question is: what are auto dealerships doing to prevent car lot thefts? Some auto dealerships may take the stance that the cars on their lots actually belong to the banks and/or are insured. This may be true, however it will get to the point where the banks no longer want to fund or back those vehicles, and/or insurance companies may start raising rates and canceling policies if the dealers do nothing about it. 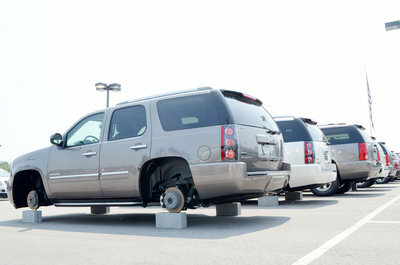 One hundred and forty 20-inch wheels and tires were stolen from a Dallas car lot. Police say 15 vehicles were blocked up with cemented blocks; a total of 60 wheels and tires were taken. Police added, a citizen driving by noticed some missing wheels and reported it that morning – Dallas news. Sadly that story is very common and not only are tires being taken from the vehicles but catalytic converters, mufflers, taillights, radios, airbags, etc. are being targeted as well. Even used cars are being stolen as thieves are filling orders from customers that have older cars and need replacement parts – so no vehicle is safe whether it’s a new car lot or a used car lot. Car lot thefts come in waves? The rate of car burglaries doesn’t remain the same throughout the year, it rises and falls. Law enforcement experts believe these “waves” in thefts indicate there are well-organized groups behind the crimes. These groups target and operate in a specific area for a certain time frame and before the police can get any leads on them, they move on to the next area. Q: Why do these groups target parking lots in particular? A: The answer is, the majority of parking lots are unprotected and don’t have any or very little security, e.g. surveillance cameras and security guards. A criminal and/or spotter can watch your lot one night and tell whether you have security guards, if you have cameras, where the cameras are, and where the easiest points of entry and exit are located. Cameras no longer scare criminals away – simply wearing a mask and gloves, to include removing the license plates off the suspect’s vehicle, renders your expensive camera system useless. You will arrive back to your car lot in the morning to see that several vehicles have been stolen or that parts were taken from them; however, your camera system will have great footage of the masked men committing the crime and driving away free as a bird… so cameras are not always the best answer. How to protect yourself against car lot theft? A camera system isn’t bad it just can’t be a stand-alone item; it can easily be defeated by a criminal simply wearing a mask – also, a camera cannot call the police or handcuff a suspect. Your best bet in protecting your car lot is to have a security officer posted on your property for the hours that you are not there. Nothing beats having a uniformed officer making foot patrols and approaching suspicious individuals, to include investigating unusual activities. While some auto dealership owners will elect to have random vehicle patrol services which includes a security office patrolling your property every other hour; this is not the right tool. A vehicle patrol service will not discourage a determined criminal who is watching the time intervals of the vehicle patrol service and waiting for the guard to exit your property, leaving the criminal ample enough time to take exactly what he’s had his eyes on. Again, a posted uniformed officer on your property will provide the best desired effects to eliminate theft. The chances of a car lot being burglarized is more likely than not; so why risk losing thousands of dollars? Taking proper security measures will intimidate criminals and help to eliminate the chances of your property being stolen. Asecurity guard service can quickly reduce spikes in auto thefts occurring throughout Austin.